UPDATE: Old school leadership or just a joke? You are at:Home»Air Force»UPDATE: Old school leadership or just a joke? 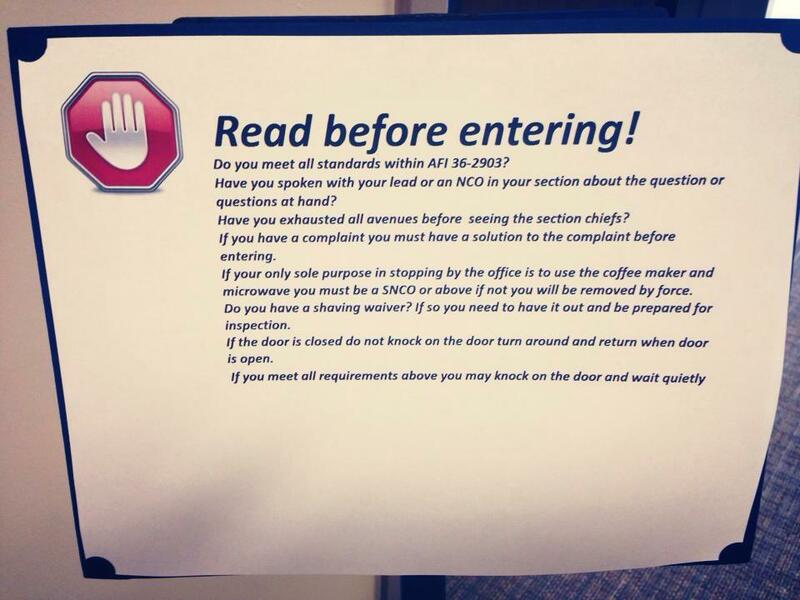 An airman sent Air Force Times this “Read before entering!” sign that was posted near the section chief’s office for the 6th Aircraft Maintenance Squadron at MacDill Air Force Base, Fla. The sign caught the attention of airmen at MacDill, who posted it on the base’s Facebook page. An airman also sent it to Air Force Times. But as quickly as it went up, the sign was gone. “A master sergeant in the section chief’s office put it up as a joke. The sign was taken down before it even got on Facebook,” said an airman with the section chief’s office at the 6th Aircraft Maintenance Squadron who asked not to be named. “We have a lot of individuals that just come through with basic and easy questions, which they could have gotten from either their supervisors or someone they work with,” he said. The sign drew mixed comments on Air Force Times’ Facebook page. Some applauded an enlisted leader’s attempt to instill common sense. “This is TEACHING leadership because it’s encouraging a measure of self-reliance,” one user posted. Others said it was autocratic. “Seriously? This is leadership by fear; whoever put that sign up should be ashamed,” wrote one poster. “Wow, didn’t know NCOs are gods,” wrote another. Sounds like some R.O.A.D SNCO that needs to retire ASAP. All that sign does is discourage that Open Door Policy that we hear so much about all the time. This is a variant of the old “can you follow directions” (aka “idiot test”) joke. Google “read all instructions before you start” for more. This is the problem with Airmen today. They feel like they are entitled to something that must be earned. Even if it was not put up as a joke, there isn’t anything on there that indicates you should “fear” the NCO. Everything on the poster is the mark of what any NCO should emulate, as listed in the AFI, and as a matter or respect, politeness, and within good order and discipline that the military requires from all Airmen. If you don’t like it, then maybe the Air Force isn’t for you. Really?? Work your issues at the lowest level first, don’t whine without having a proposed solution and don’t look like a dirt bag…seems like common sense and GOOD leadership. People need to stop with the hurt feelings and grow up. You’re in the US Air Force, the most powerful Air Force in the world…act like it! As far as the comments that “didn’t know NCOs were gods”…we’re not, but most of us have worked hard to get to where we’re at and respect HAS been earned! Too many younger NCOs and airman (yes, not ALL of them) have zero respect for authority and feel entitled to do what they want because they were wronged by some SNCO that told them to stop talking on the cell phone while walking and to take their hands out of their pockets. I agreed with the lines about using the chain of command to answer easy questions. I was on the fence with this until I saw the coffee maker and microwave line. Really? Removed by force? Talk about elitism. Also, it appears that a certain SNCO needs to be instructed on the use of commas and informed as to what a run on sentence is. Things like this make me glad I got out when I did and have my DD214 in hand. Lol @ maintenance yahoos always acting the fools. Do yourselves a favor and get out of maintenance when you still can there is a wonderful air force full of jobs where you don’t work 12hour shifts or weekends. Plus you don’t have to deal with things like this. This “Chief” should be there for his people. Why people need to meet all kinds of personal criteria to see this guy? Poor management, disconnection from his people and non-sensitivity that what this “Chief” is showing. We SNCO’s exist to translate Upper management goals into precise instructions and standards for all to follow. What would happened within this squadron is they have a sexually assaulted victim? Would these instructions apply? The Commander should take action!! Because, he could be accountable too!! Honestly, I think this sign is needed all over the Air Force. Yes, as an NCO, I am a teacher, but I am also responsible for ensuring my Commander has a well trained and well disciplined force. In today’s Air Force we have Airmen that sag their uniforms and wear their ABU Covers like they are in civilian attire. We have airmen that are to lazy to shave and to lazy to go through the process of getting a shaving waiver. That laziness transcends into their work ethic and their laziness when it comes to studying for upgrade training. Personally, I think the only “Open Door” Policy in a Unit should be the 1st Sgt’s door. My commander is already inundated with priority taskings and tons of meeting with his boss. My job is to take care of everything I can on my level and teach my airmen to do the same. My Superintendent should not have to worry about the things that I can take care of. As a Retired SNCO, always felt time was precious. Not to ignore my airmen but to stay focus on tasks at hand. Anyone offended, bothered, or upset with this posting shows why discipline has declined. Leaders must instill proper protocol and by example allow peers to see priorities. At first I would have thought the USN CPO corps had this written; still believe it originated from them. They know how for the most part ensure good order & discipline regardless of job/career field. 1. I don’t care how hot or dirty you get performing your job, I don’t care! 2. Don’t bother me with your problems. Talk with someone who cares. 3. I don’t have the answers, so again don’t bother me. 4. If you don’t outrank me get out of my sight. You disgust me. 5. I don’t have time for your problems, and to keep you away from me I will intimidate you. 6. If the door is closed, don’t knock. I’m working on my next promotion and your interruption may hinder my performance. 7. If all these conditions are met, you may knock, but remember I just said not to knock. I can’t believe troops would whine about such a sign on the door. I guess its because it is the Air Force…..god forbid if an airman’s cable tv goes out in the “Enlisted Dormitory”…hah! Just a fancy name for Barracks! I think this is just a reminder to check yourself before you wreck yourself. We have a chain of command for a reason and to bypass the NCOs and go straight to the Section Chief is a foul. Gone are the days of airmen tip toeing by the chiefs office, now they just walk straight there if they have a grievence. Sad part is, the leadership allows it which makes the NCOs authority and decsion making capability worthless. There’s a difference between being there for your people and being asked, as a chief of a large section, to teach your Airmen their jobs. I have an entire line of competent NCOs that these young Airmen should be going to before they come to my door. My only complaint is that there is a need for this sign at all. Wear your damn uniform correctly, use the damn chain of command, and understand that my office is not the rutting town hall. As a Staff Sergeant, US Army with 12yrs of Service I feel people are taking this Sign to seriously. It was posted so fellow Airmen of his Maintenance Squadron would get a laugh. Even I read it and laughed. Typical maintenance mindset here. Those aimen should know that in other career fields SNCOS do not even consider things like this. Do yourselves a favor and cross train out of maintenance while you are young and see the real AF.